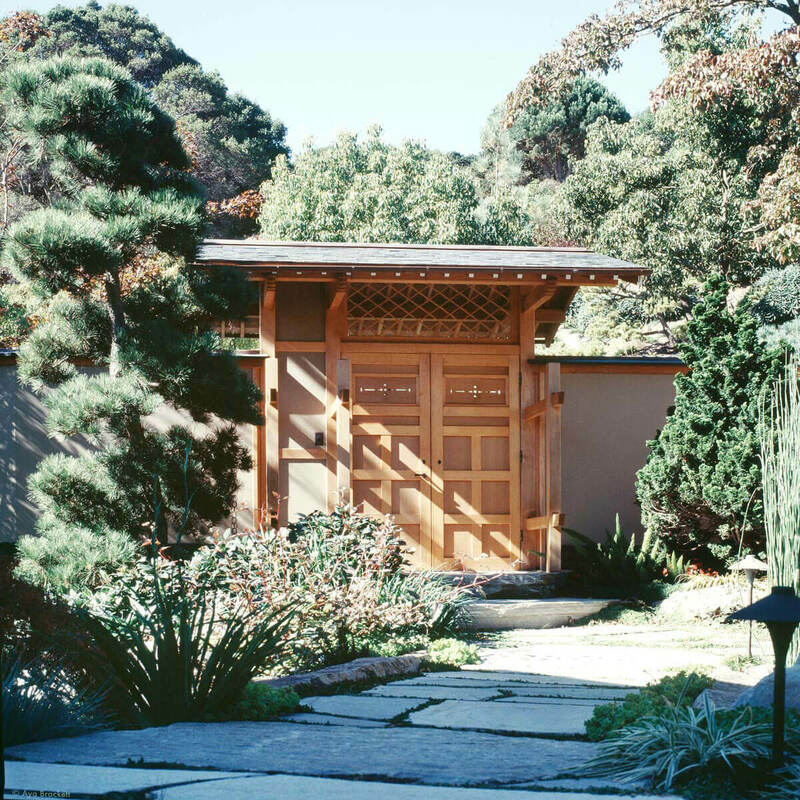 East Wind (Higashi Kaze), Inc.
East Wind (Higashi Kaze), Inc. designs and builds traditional Japanese architecture, adapted to meet western architectural expectations. Since 1976, we have worked with clients and contractors to build houses, interiors and other structures throughout California and the rest of the world. (Left) Sunlight reflects off of a copper roof. The exterior engawa (veranda) of a house in Ross, California. There are glass doors on the exterior and paper shoji inside the glass. 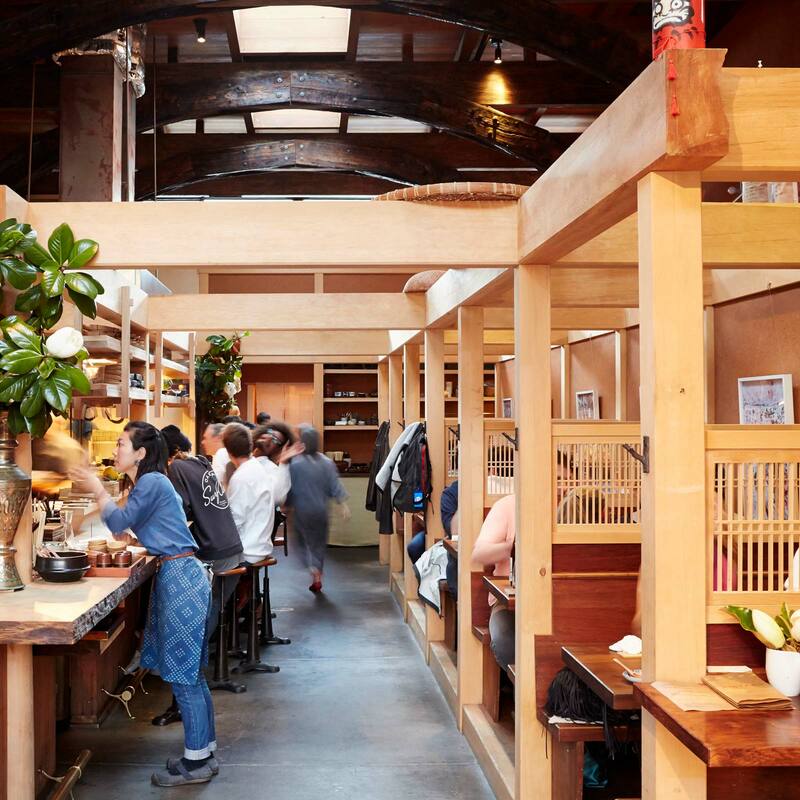 Rintaro in San Francisco: The bar on the right is a single slab of Port Orford Cedar (hinoki) killed in a 1936 forest fire and pulled from the woods in 1976. The wall is a soil plaster. East Wind is led by Len Brackett, who trained as a temple carpenter in Kyoto. While traveling through Japan in the 1970s, Brackett serendipitously met an abbot at a temple in Kyoto. 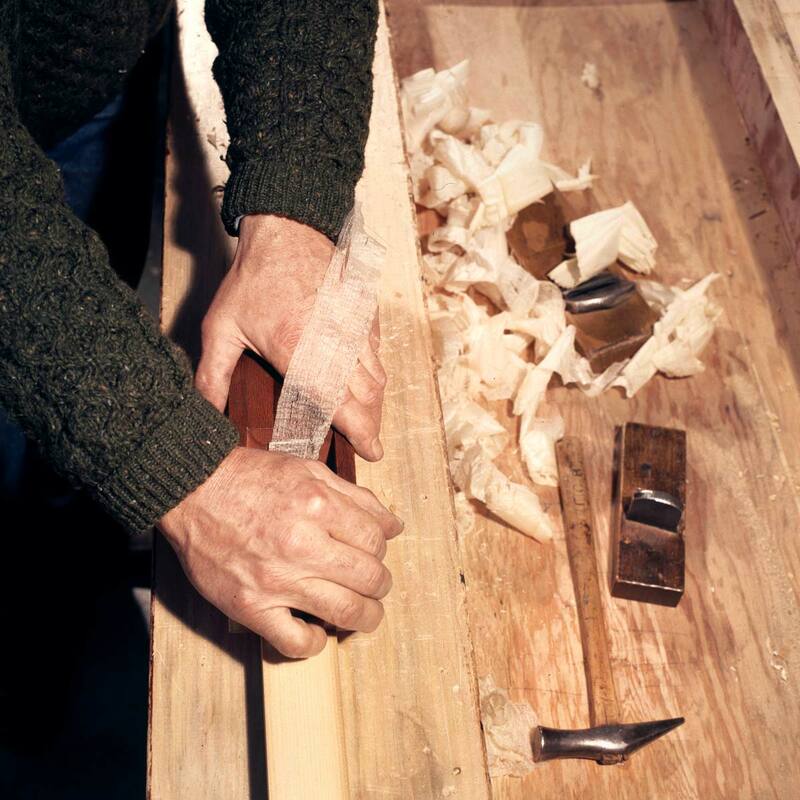 After uncovering Brackett’s interest in carpentry, the abbot connected him with a group of very skilled and gentle local craftsmen. Brackett spent the next 5 years apprenticing alongside them. 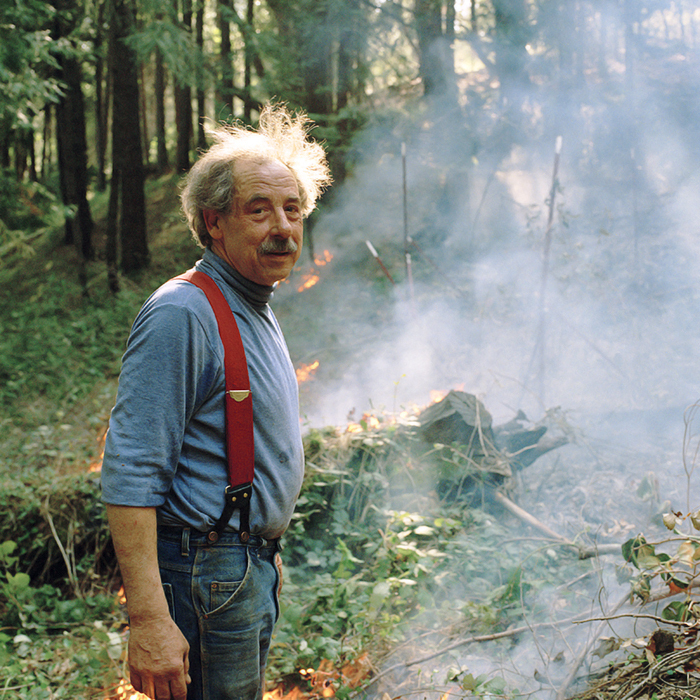 Len Brackett on his property in Nevada City, California. The Japanese hand plane produces a very thin shaving which leaves an impossibly smooth finish. 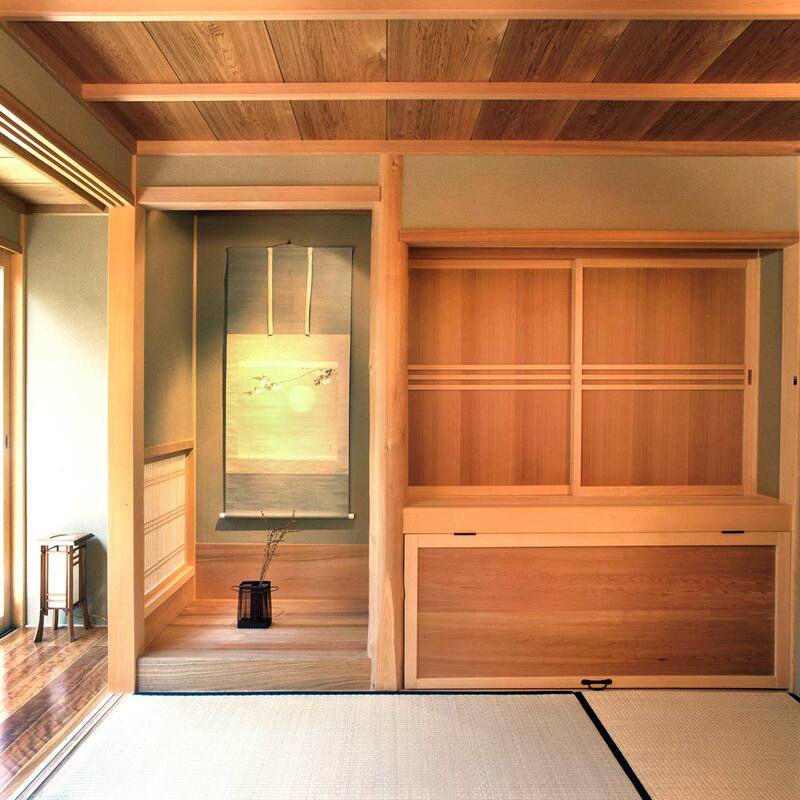 Temple carpentry, along with tea house carpentry, is considered the pinnacle of the craft tradition in Japan. A body of knowledge accumulated over centuries by craftsmen who habitually refine every element of their trade isn't picked up easily. The work week was 70–80 hours with rare days off. Upon his return to America in 1976, he began a new study: adapting this architecture to meet western expectations. toward a bath in the furthest wing. 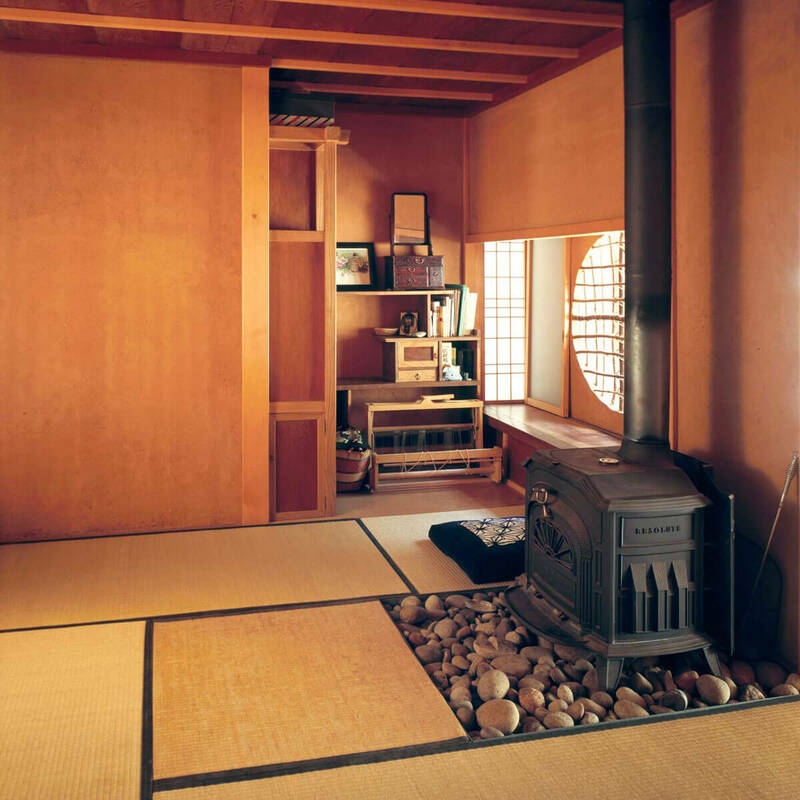 The 18th century Japanese house was remarkably efficient. Houses were modest and utilitarian, designed to use limited resources. They required about half the floor area that western houses require for the same functions. They provided a cool, shaded escape from hot summers, and basic shelter from the elements to get occupants through cold winters. 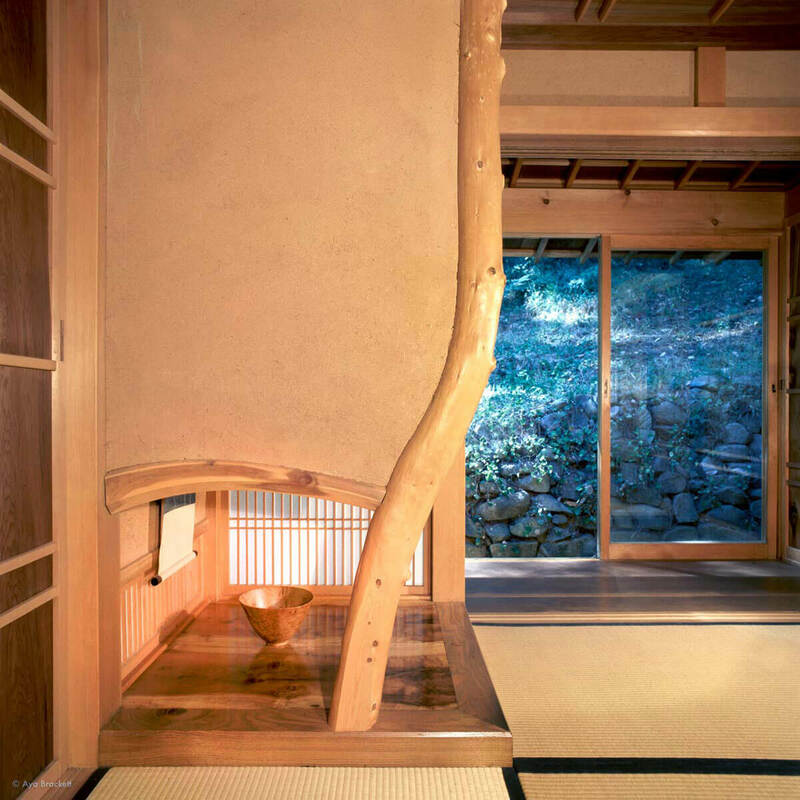 Rooms were flexible and multifunctional: throughout the day, they could be converted for a variety of uses by simply arranging the sliding fusuma doors that made up the interior walls. 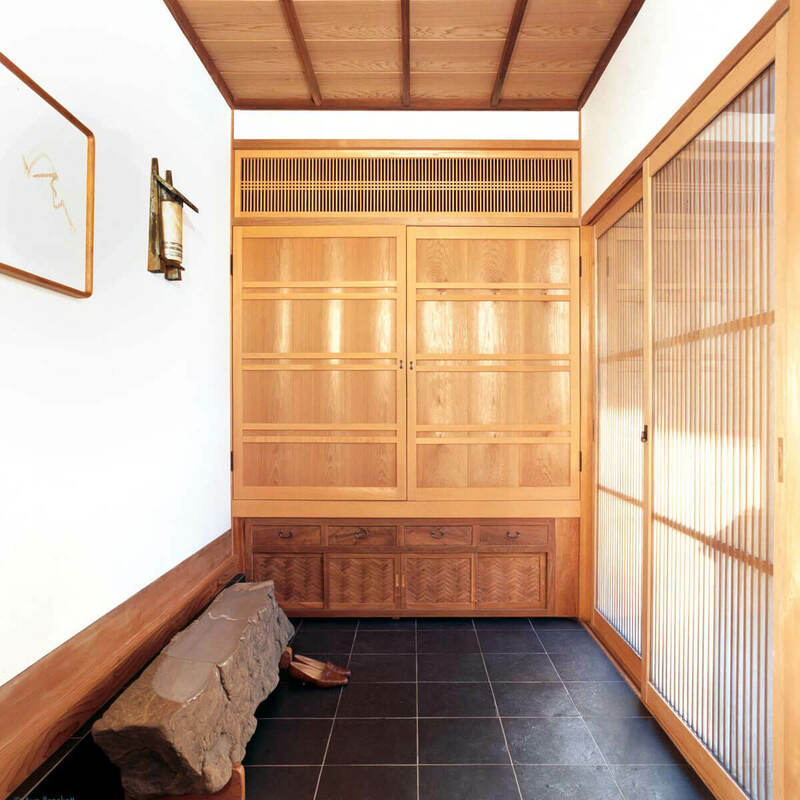 The paper of the exterior shoji walls allowed light to filter throughout the house while providing better insulation than the glass windows used today. The tokonomah is a space devoted to a single painting, flower arrangement or some other treasure. Traditional study with a wood stove and bay window desk. 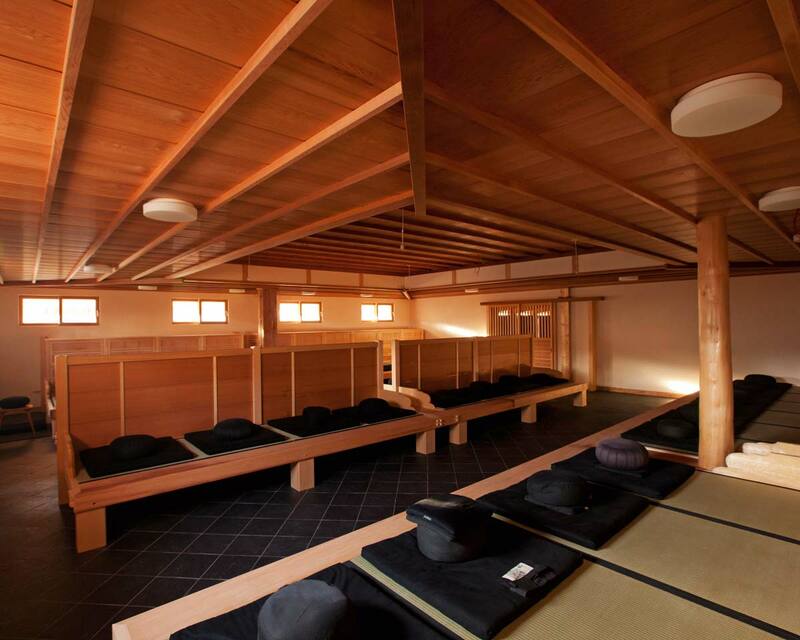 But the 18th century Japanese lived without many of the physical comforts we take for granted today. They lived on the floor, without furniture, and without a place to rest one’s back. The houses were very small and for families privacy was limited. They were dimly lit and barely heated by a single wood-burning hearth (irori), also used for cooking. This is not the way most Americans (or Japanese) want to live today. While the traditional architectural form is without doubt very beautiful, it doesn’t satisfy contemporary expectations of comfort. Occasionally, we are asked to design and construct the old style, which we are happy to do, but we find that most clients prefer living with the comfort of basic modern amenities like furniture, electricity and central heating. The open hearth at the bottom of this image is called an irori. The hook that the lantern hangs from can be used for heating a pot over the flame below. We use traditional Japanese techniques to build comfortable, contemporary houses. 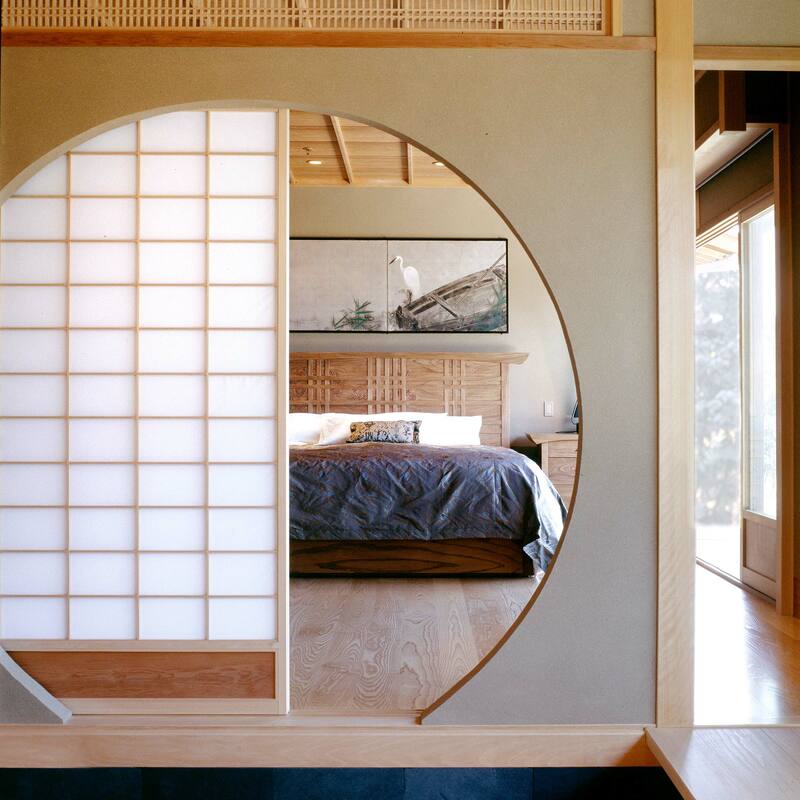 Our goal is to merge the quality and feeling of traditional Japanese architecture with the basic comforts we’ve all come to expect in a modern home. 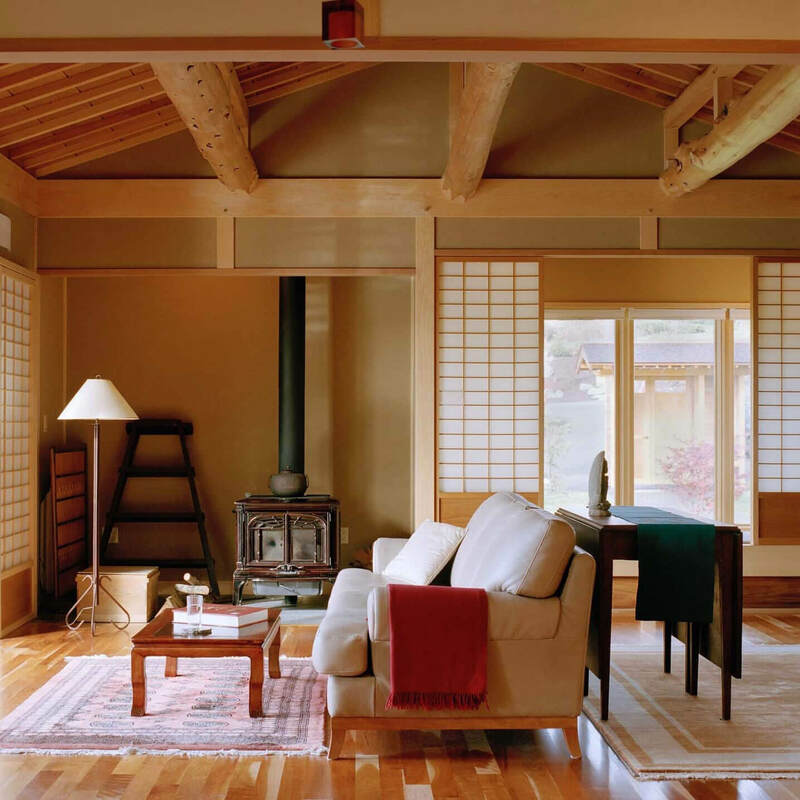 We’ve developed adaptations that retain what’s so lovely about traditional Japanese architecture while at the same time allowing for modern-day elements like furniture, central heating and electricity. We prioritize the precision and elegance of the traditional form while finding subtle ways to incorporate contemporary amenities. This is not a thin Japanese veneer applied to a western building—it’s the real thing. This is a typical genkan (entry) with shoe storage below and outerwear storage above. 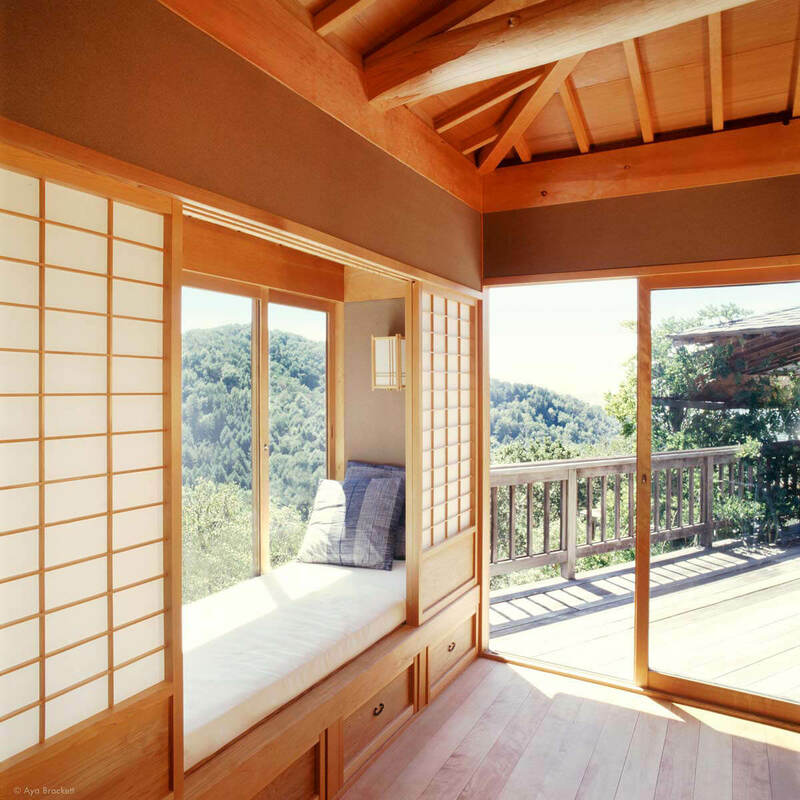 A daybed which can be partitioned using sliding shoji. Looking across an interior garden into the master bedroom. This garden is inside the house, under an open finished roof structure. The opposite view is visible in the previous image. 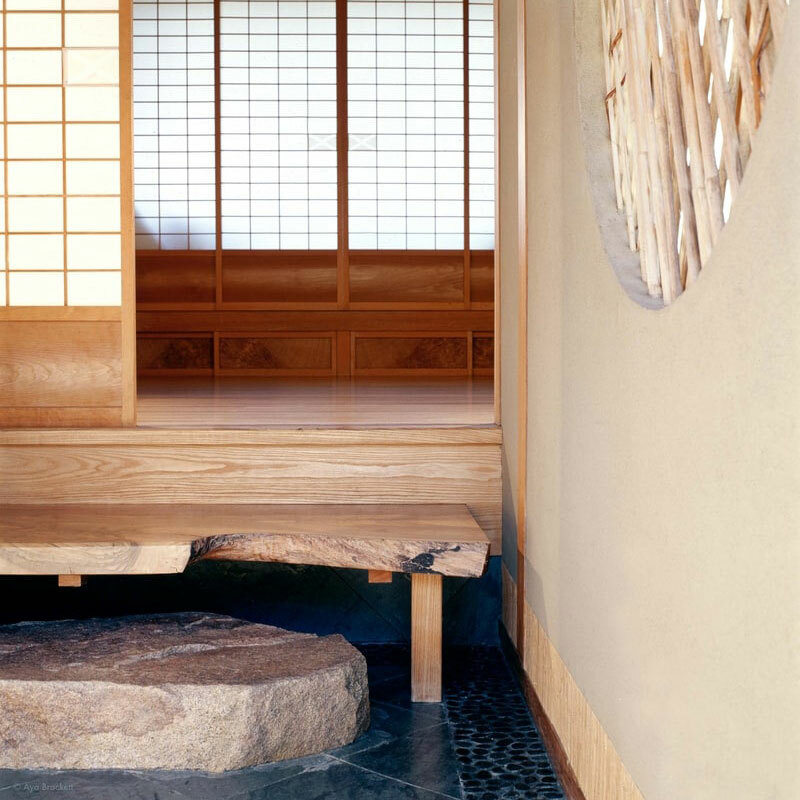 The traditional architectural forms found in Japan are essentially pure structure which is meticulously joined using complex, interlocking joinery. This carpentry is so precise it doesn’t need to be covered up with moldings and trim. It’s the same precision found in custom furniture. So, we almost never test-assemble anything—the joinery is so tight pieces would be damaged in trying to take them apart once assembled. 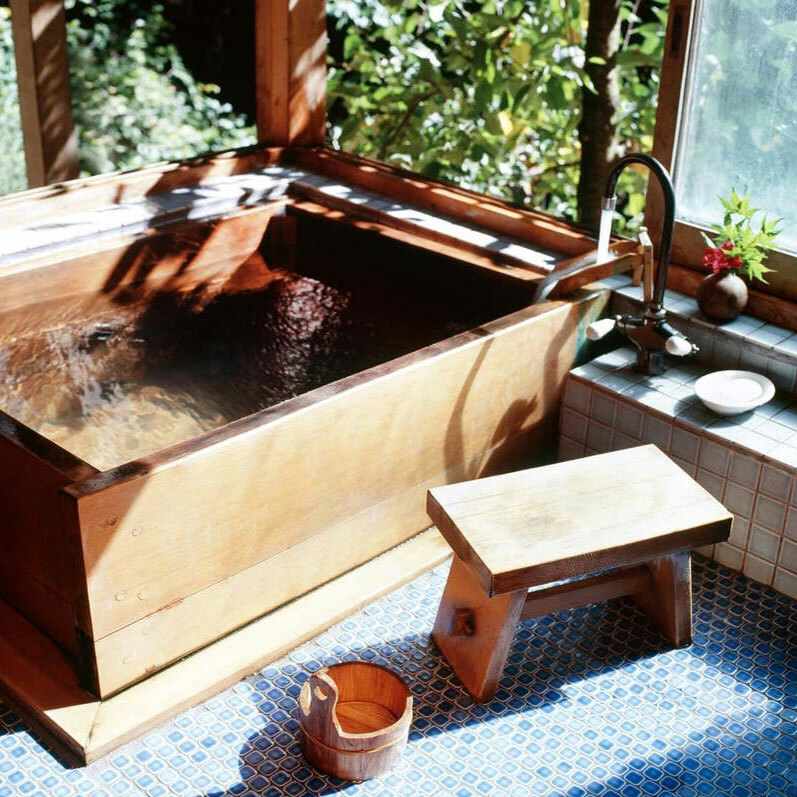 East Wind's owner's bath with view of Spring Creek. 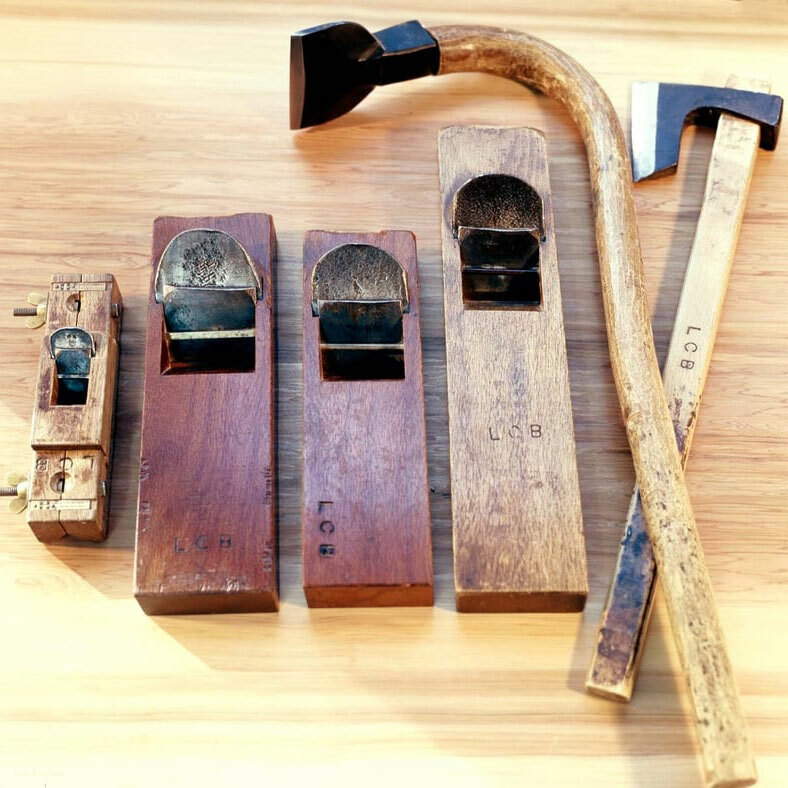 Axes, adze and hand planes. About half of any job is completed in the shop before our materials go to site. The structural and finish elements of each house are pulled from our lumber decks, jointed to make the lumber perfectly straight, flat and square and then milled to precise dimensions. Following that, each piece is allocated to specific locations in the house. All the joinery is drawn out in ink before the joinery is cut out, and the pieces are then hand-planed to silky smoothness, chamfered, wrapped in shrink wrap, and safely stored before going to the site. 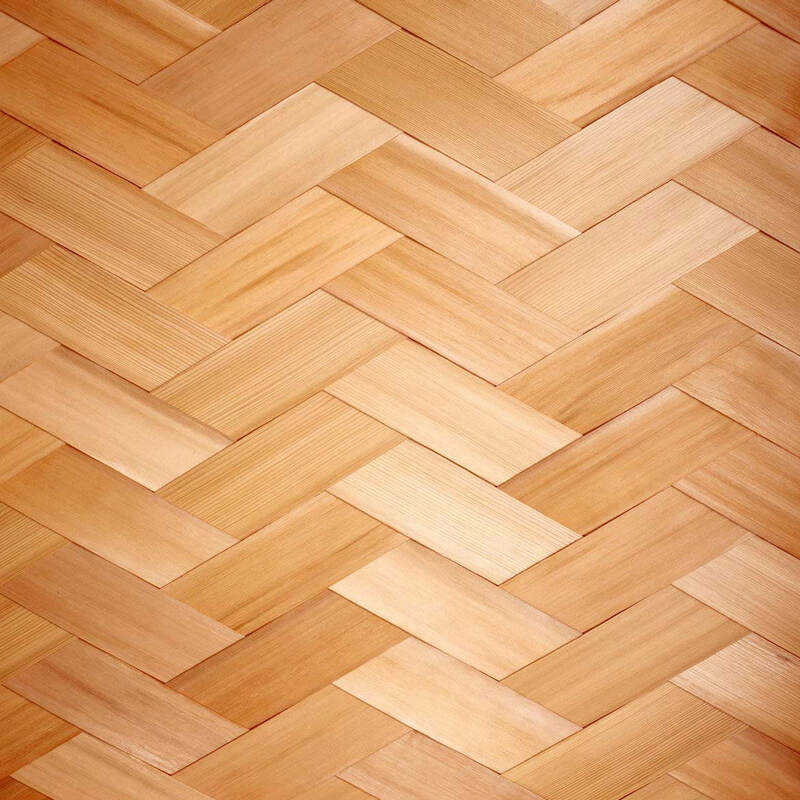 Most of the species of wood we use are not available at building supply yards. Some boards can take years to cure—an unreasonable amount of time for most clients to wait. So for the last forty years we have accumulated lumber to become our own lumber yard. We have on hand two acres covered with lumber decks, about 250,000 board feet of many species sawn to our specifications and cured to proper moisture content. Interior of a conventionally framed house in Puget Sound. What you see is a real timber frame. 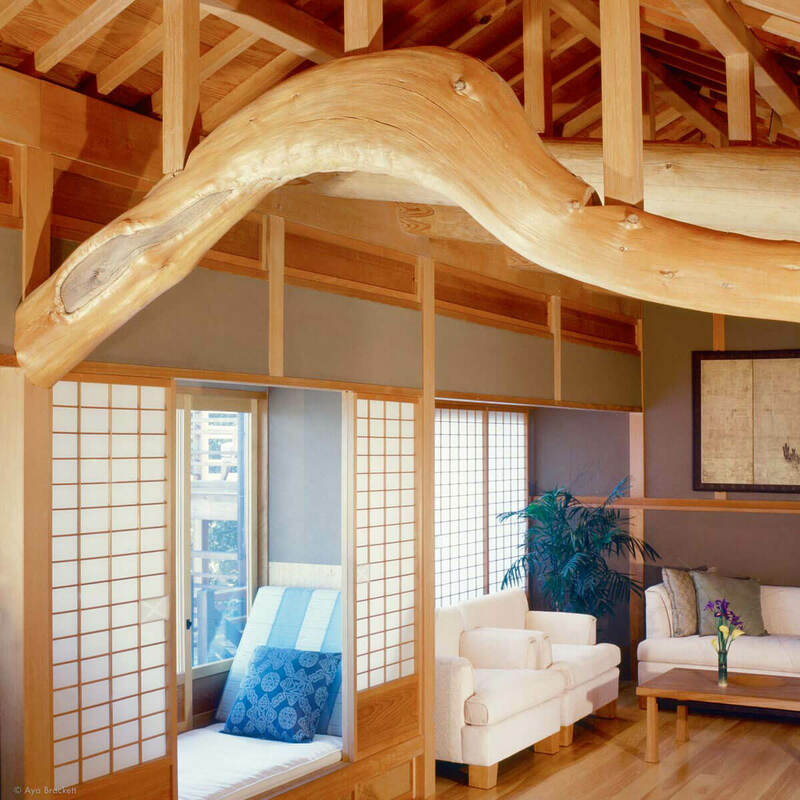 An unusual incense cedar log supports the roof load above this living room in Marin County. The cedar panels up near the roof are actually light fixtures, made from very thin plane shavings and laminated to a sheet of glass. They are back lit and gently illuminate the room at night. We design and build entire buildings, wings, cores, and components. Our work is somewhat more expensive than standard housing because it requires more careful labor, but we can work with you to try to meet your budget. We have overseen the design and construction of structures as simple as elegant garden seats and gates to projects as complex as multi-million dollar houses, board rooms and executive suites. (Above) Redwood fixtures—recycled Sebastiani wine tanks, natural soil plaster wall, sugar pine timbers and posts. (Below) In 2016, Bon Apetit named Rintaro as one of the ten best new restaurants in the US. 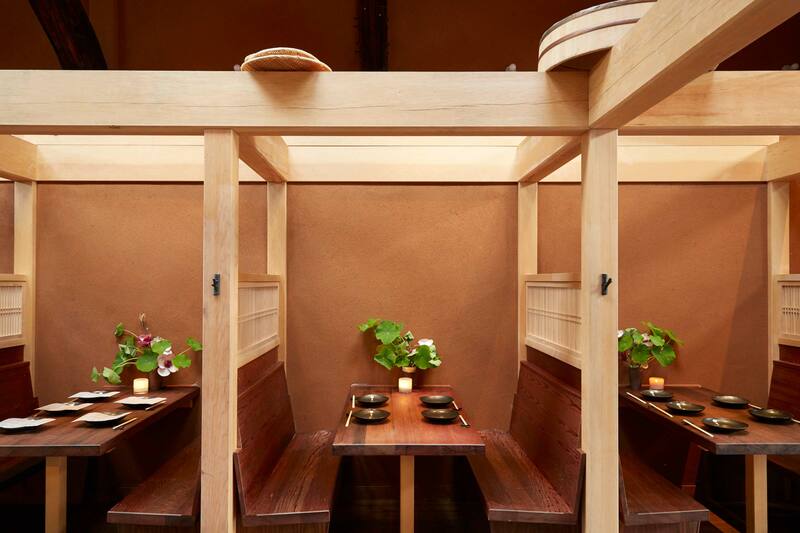 Entry to Rintaro in San Francisco. There is a lean-to roof over the entry timber frame and the plaster is natural soil. Rintaro is owned and operated by Len Brackett’s son, Sylvan. The bigger the house, the less can be spent per square foot within a given budget. Big cheap houses often haven’t had much time spent in their detailing, and they just end up being cavernous, bland, and soulless places. For this reason, we recommend building the smallest house that will provide the spaces you require. Smaller, meticulously done houses are what most people come to us for. This house was built in Marin County, California in 1987, and it has an interlocking copper shingle roof built with shingles that were made on site. At the entryway, visitors step from the slate floor to a walnut step-up board as they remove their shoes and enter the house. We work with clients to explore and select the appropriate location, style and floor plan for their project. 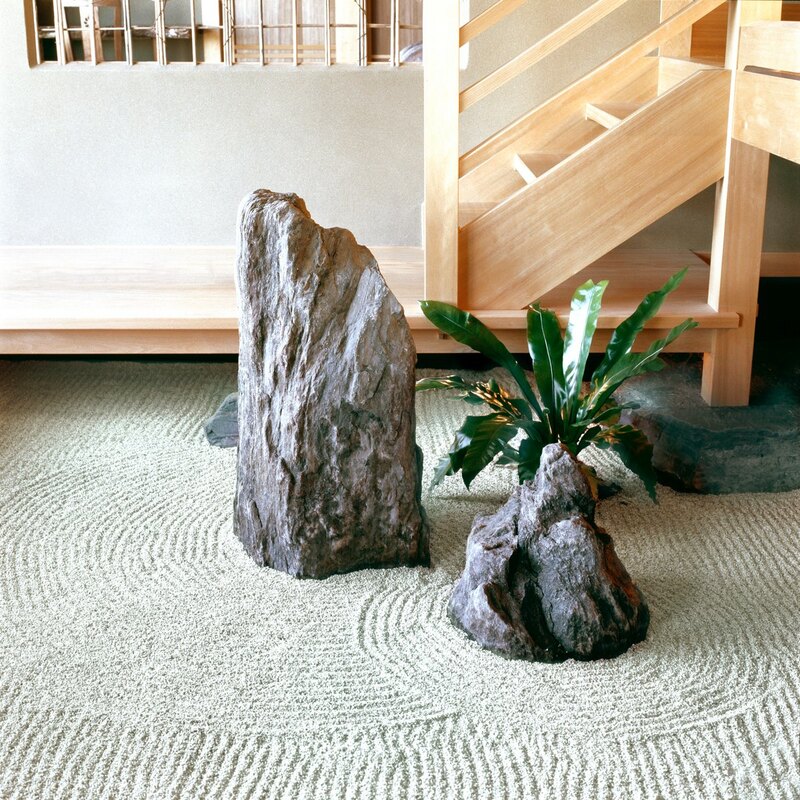 Your structure should complement its surroundings: traditional Japanese houses tend to focus on a garden, but it can just as easily be a view, a copse of trees, a rock outcropping, a river, creek or another beautiful, natural element. Once we have a place in mind, it's best to spend time there observing the light, in the morning, at noon, in the evening and into the night. If there's time—we also observe it during the solstices and equinoxes. The design process for a normal-sized house should and usually does take six months to a year; we believe in giving the process enough time to develop naturally, with frequent communication between East Wind and the client. House compound in Marin County, California. As craftsmen, our job is to make things people want us to make and do what they want us to do. Most of our clients come to us for guidance on important design decisions, but this is their house, not ours. We’re here to make our clients’ vision a reality. If you're interested in having us do some work for you, please read through our Frequently Asked Questions first, then send us an email or give us a call. Exterior of a very traditional house in N. California. This is the real “wattle and daub” wall, an ancient way to make a wall. You should have a place to build, a list of the modern conveniences that are essential to you and an idea of how much space you need. It’s a waste of time to design a house without a specific place to build it because the siting of the house is so critical to what we build there. If you’re building a house: We strongly recommend building the smallest house that will provide the spaces you require. We can and have built large houses, but smaller, meticulously done houses are what most people come to us for. We saw a gap in the literature about Japanese architecture that addressed how it was done, so we decided we needed to write a useful book about the process of designing and building a Japanese house. Building The Japanese House Today, Brackett and Rao, Harry Abrams Press, 2005 is available at your local bookstore, or failing that, at the link shown here. Our work isn’t cheap in either cost or quality. It requires a lot of time, even with a well equipped shop and its highly skilled people. Our houses start at $400 per square foot and can go up from there if the client wants. Make a list of the rooms you would like to have. Then go back and mark the ones that are essential to you. Next to each room note the dimensions you think you’ll need. As much as possible try to dimension these rooms in increments of 3 feet. (3’, 6’, 9’, 12’, etc). Tatami, the basic module of all traditional Japanese houses, is 3’×6’ feet—and all of our lumber is cut to these lengths. 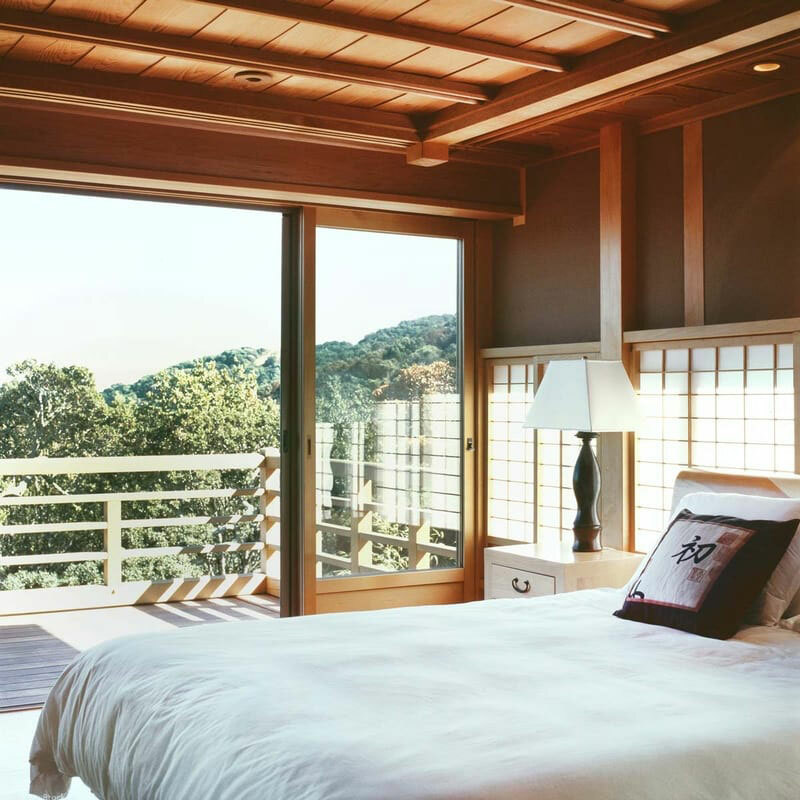 For reference, a standard Japanese bedroom is 4.5 mats (9’ x 9’) or 6 mats (9’ x 12’), whereas an average Western bedroom starts at about 10 mats (12’ x 15’). Using your room list, sketch out up to ten floor plans. Don’t get too detailed! You don’t want to get too attached to a particular floor plan, so it’s best to do this freehand in pencil. Find some ¼–inch or ½–inch gridded paper and count each grid square as 3’×3’. Entertain any goofy idea you might have: a lap pool in front of the entry, a lookout tower, a pool in the basement, a garden inside the house—whatever. Cover as many ideas as possible, even the lunatic ones. When you complete one, put it in a drawer and don't take it out again. Don't make different versions of the same thing. Once they are all done, pull them all out and pick the ones you like the most. Send the floorpans you created to us and together we can decide which one to develop. If you can’t do this, or don’t want to, then we can wade into this with you. We can design houses to maximize the involvement of local contractors. We can build a traditional Japanese live-on-the-floor house, which uses half the square footage of a house designed to accommodate furniture. We can build a wing or the core of a house—usually places where you will hang out, spend a lot of time. The rest of the house can then be built using cheaper modern construction techniques. One doesn’t necessarily need Japanese laundry rooms, storage rooms or garages. Private areas of the house (bedroom, bathroom, office) can be shoes-off ‘live on the floor’ spaces with little or no furniture. Public and hang out parts of the house (entries, kitchens, living rooms) can be designed for shoes-on and furniture. In this case, there should be a clear split-level transition between the two—a place where shedding footwear is convenient. We’ll work together to assess your needs and the location for your house. Using that information, we’ll begin sketching initial layouts for the floor plan. Once we’ve found a design that feels right, we’ll produce a detailed final floor plan for approval. After we’ve finished the floor plan, we’ll prepare elevations (views of the house from the outside) with your active input and feedback. We will make suggestions, but ultimately we’re not the ones who will be living in this house and we’re not paying for it, so the client is the boss! We’ll share the proposed building(s) with the client for approval of what has been done so far. Once the client approves, we’ll have an informal meeting with planning and building officials to make sure they’re generally okay with what we propose. If things are looking good with the planning department, we’ll continue. If not, we’ll go back and revise our site plan. We’ll work with engineers to produce structural and detail drawings for the project. We’ll also put together sectional drawings and a reflected ceiling plan. Structural and energy engineers are usually required. Sometimes we’ll also need to involve soil engineers and others. This is also when we prepare a set of drawings to submit to the building and planning departments. Once the design is finalized and the project is approved, we’ll prepare a materials list and a Critical Path (CP) schedule. The drawings are a plan for what we are going to build, but the critical path schedule is a plan for how we will build it. This CP schedule details all of the tasks necessary to build the house—both work in the shop and work on-site. It will tell us quite accurately what our labor costs will be. The CP schedule will also include a timeline for subcontractors. We’ll use the materials list and CP schedule to prepare an accurate and predictable estimate and a build contract. With the contract signed and down payment is received, the work is scheduled. We’ll submit all necessary documentation to the local planning department for the formal permit application. As soon as the planning department issues the permit, we begin work on the project. We use the Critical Path schedule to do the work both in the shop and on site. We update it every two or three days. We can send PDF updates on our progress to the client on a timely basis so they can see how we’re doing. This way they know they’re not on a bucking horse heading for a cliff! If the job is not local to our Nevada City workshop, we will help you source a local contractor. If the job is local to us, we will serve as the general contractor. We usually work with a local contractor in any site too far from our shop for a daily commute. We will help the client find a local contractor who knows the local building officials, and the best local subcontractors. Unless the client is sure of the contractor they will hire, we like to be involved to help them vet the contractor. We can usually tell pretty fast if this contractor is really skilled and organized or not. A good local contractor selects and works with the best sub contractors to oversee site preparation, roads, utilities, concrete work and sometime roofing and perhaps any cabinetry we don’t make ourselves. We have no special skills in concrete work, nor in electrical or plumbing, or site preparation. So we try to limit our involvement to those things that require our special skills, equipment or materials. Any task not requiring those things can be done by a skilled local contractor probably as well as we could, only a lot cheaper, and probably faster too. It's also worth noting that local people don't need to be paid per diem and travel expenses.